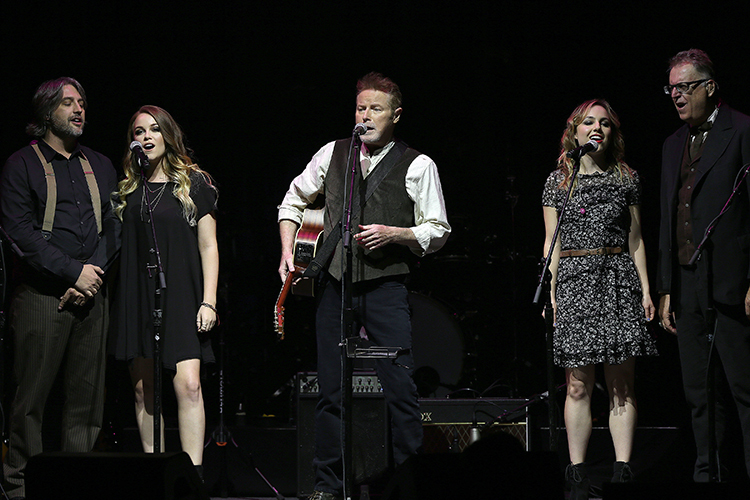 Taking a break from flying with The Eagles for close to 45 years, Don Henley’s long dalliance with country music has produced “Cass County” his first new solo album in 15 years and the start of a brief 15 date tour which brought him to the Masonic on Monday evening for just the second show of the journey. Henley’s generous 130 minute set weighed heavily on the new collection, presenting a staggering 13 songs out of the 18 performed on various editions of what quickly proved to be the first No. 1 album of his solo career and his first studio album since “Inside Job” was released when there was a Clinton in The White House and you didn’t need to plan on removing your shoes or excluding liquids from your carry-ons during visits to the airport way back in the year 2000.
to tweaking them for more of a Nashville sound. Taking the stage to open the show surrounded by the band for an a cappella version of Steve Young’s ( NO, NOT that Steve Young ! ) ‘Seven Bridges Road’, the only cut all night that first appeared on an Eagles release, it was clear form the outset that the Masonic’s usual stellar acoustics were in fine form and that this evening’s concert would not be affected by the unfortunate technical difficulties that plagued Henley’s opening night performance in Phoenix where the PA system shut down on numerous occasions. For the 68 year old singer-songwriter, drummer and founding member of the band that has outsold ALL others in the United States with the sole exceptions of The Beatles and Led Zeppelin, the release of a country album isn’t so much of an attempt to reinvent himself as it is a return to his original country rock roots as evidenced by often being categorized with fellow talents such Linda Ronstadt and Jackson Browne early in his career. Just like Sheryl Crow and Peter Gabriel recently, and Bruce Springsteen and Neil Young frequently over the course of their long careers, Henley has certainly earned the right to mix it up a bit, and he does so with style. Scattered periodically throughout the set, solo standouts like ‘The End of the Innocence’, ‘Heart of the Matter’, ‘New York Minute’, ‘Dirty Laundry’ and ‘The Last Worthless Evening’ might have elicited the strongest reactions from the crowd based on familiarity alone, but the arrangements of the new material truly left the audience with a memorable impression of a strong album. While the third quarter of the show might have stretched the presentation of the new material a bit much for some, including a stretch of seven out of nine tracks, it did have its highlights. Joined by an All-Star cast of friends such as Merle Haggard, Dolly Parton, Mick Jagger, Alison Krauss, Miranda Lambert, Vince Gill, Trisha Yearwood and Martina McBride on the new album, their contributions and harmonies were more than ably executed by the tight backing band as highlighted by Lara Johnson covering Yearwood’s duet on ‘Words Can Break Your Heart’ featuring the verse ‘Sticks and stones may break your bones, but words can break your heart’. Still of exquisite voice, Henley treated the sold out crowd to numerous additional covers. Screaming’ Jay Hawkins ‘I Put A Spell On You’ was the first, Randy Newman’s ‘Let’s Burn Down The Cornfield’, Tift Merritt’s ‘Bramble Rose’ (the opening song on “Cass County” recorded with Jagger and Lambert), and Garth Brooks ‘It Don’t Matter To The Sun’ came later in the set, but it was a two song interlude introduced with a reference to Donald Trump beginning with ‘Too Much Pride’ that was followed by Tears For Fears ‘Everybody Wants To Rule The World’ that lifted the crowds energy level as the evening neared it’s end. 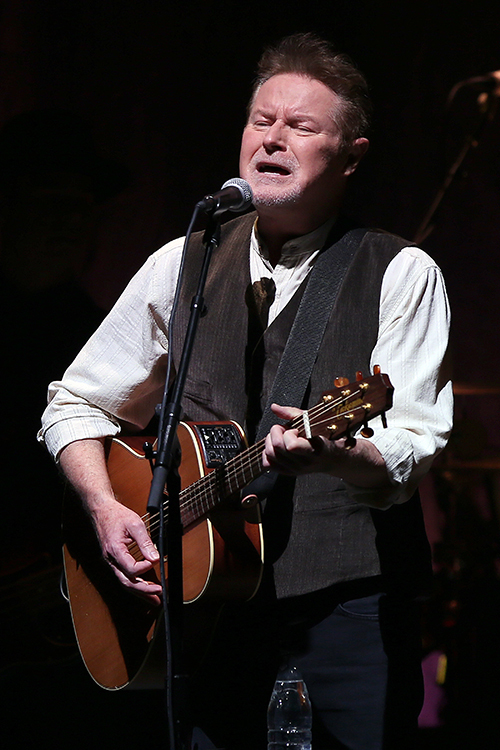 Including mega-hits “The Boys of Summer’ and ‘All She Wants to Do Is Dance’ (with the stellar horn section) in the three song encore was a strong and upbeat reminder that even when you discount all the Eagles classics, Henley still has an abundance of great songs from his solo catalog alone. With his musical genius, here’s hoping that it’s nowhere near another 15 long years before his next release, whatever genre he decides to produce for us.